Paper beads are made by tightly rolling up long triangles of paper. 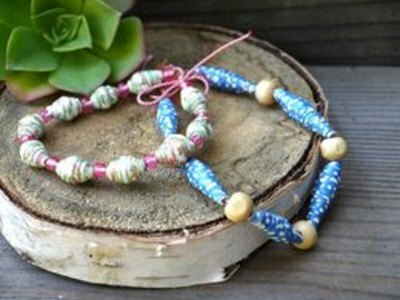 They can be made from colorful crafting paper like the beads shown here or from recycled materials such as magazine pages, newspaper or junk mail. You can even make your own design by coloring white paper. Make sure to use permanent markers or they will bleed once glazed. The size of the paper triangles determines the thickness and length of the beads. 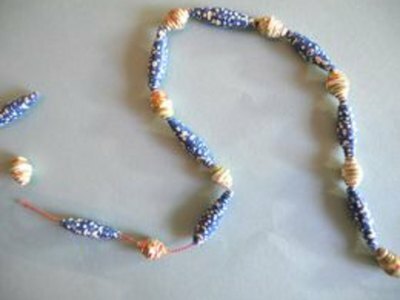 Two different paper bead variations are shown here: Short thick beads and thin long beads. 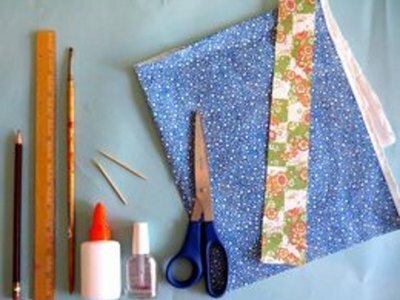 Paper beads can be made with thin strips of paper, toothpicks and glue. Please see the last slide for an itemized list of tools and materials. 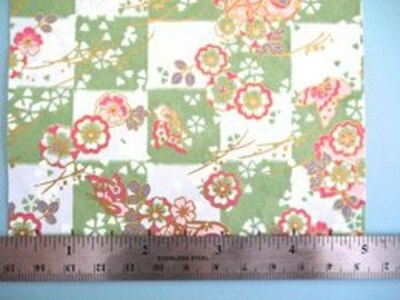 Measure and cut a piece of decorative paper that is 12 inches long by 10 ½ inches wide. 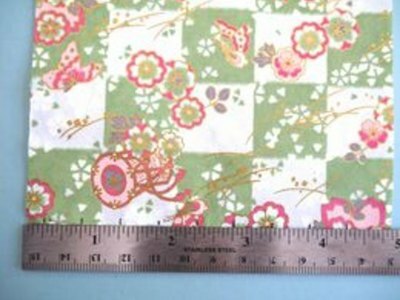 Note that the width determines how many beads you will be able to create: You will get about 2 beads per inch. So, the 12"x10 ½" piece of paper will yield 20 beads (the extra ½ is added in just to be safe). 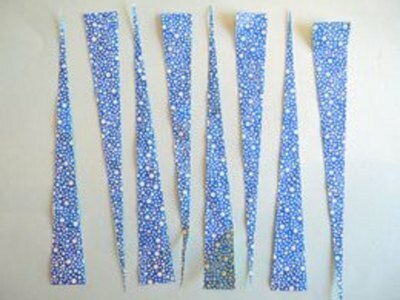 If you want more beads, make your paper wider. Place a ruler across the width of the paper (this is the 10 ½-inch side) along the very bottom of the page. Make a small mark every ½ inch along the width of the paper. Next, place the ruler across the width of the paper, but this time at the top of the page. Mark every ½ inch but this time beginning at the ¼-inch mark. When you are finished, you will have marks at opposite ends of the paper that are offset from one another by ¼ inch. Connect your marks -- going from one side of the page to the other -- using a straight edge and cut out. Or you can simply cut from mark to mark if you are using a cutting knife or trimmer. You will get several thin, long triangles. Begin rolling the wide end of a paper triangle around a toothpick, being careful to keep the paper centered and taut as you roll. 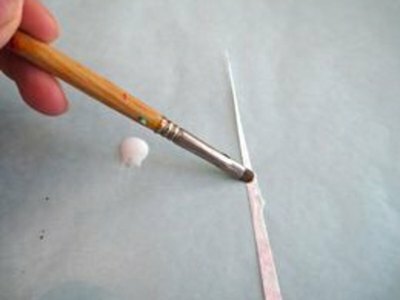 When you reach the last 3 inches of the triangle, paint the tip of the triangle with white glue and continue rolling. 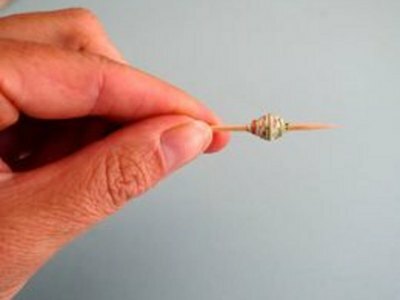 At this point, your bead should hold nicely, and you can remove the toothpick. 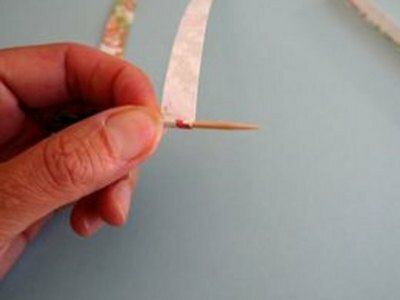 The technique is the same for long, thin beads and short, thick beads, but the length and width of the paper and measurements are different. 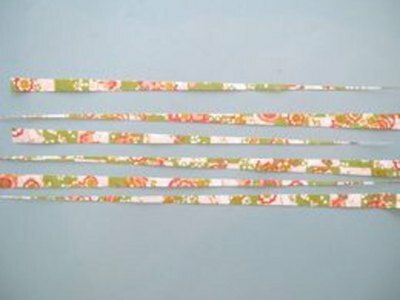 For long, thin beads, measure your paper 7 inches in length. The width you choose determines how many beads you will get: In this case, roughly every 1 inch of width will yield 1 bead. Give yourself about 1 inch of extra paper just to be safe. So, if you have a 7"x11" paper, you will yield 10 beads. 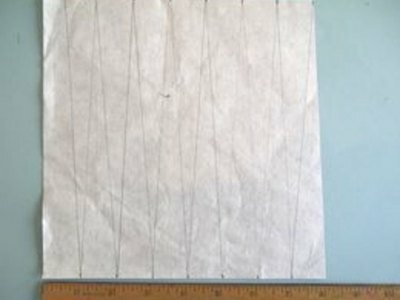 Along the width of the paper (this is the 1 inch side) at the bottom of the page, use a ruler and pencil to measure and make a mark every 1" along the paper. On the top of the page, do the same thing but this time beginning at the ½ inch mark. Using a pencil, connect your marks with a straight edge or ruler and cut along these lines so you form thin triangles. Cut out triangles. Begin rolling the wide end of a paper triangle around a toothpick, being careful to keep the paper centered and taught as you roll. When you reach the last 3 inches of the triangle, paint the tip with white glue and continue rolling. Carefully remove the bead from the toothpick. 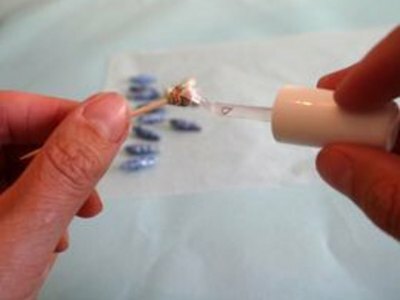 Once beads are rolled, you can glaze them with clear nail polish to set the seal and give your beads a glossy shine. To do this, place a bead to the tip of a toothpick and paint with nail polish. It works best if you keep the brush stationary and rotate the toothpick. You can leave the bead on the toothpick and stick into foam to dry, or you can carefully place it onto wax paper. 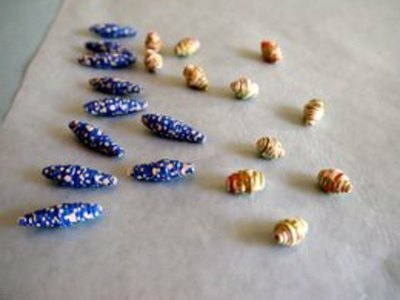 Allow the bead to dry completely and add another coat of nail polish if desired.